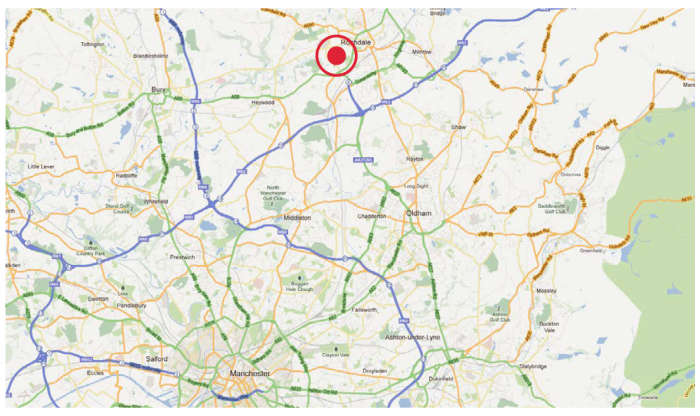 The property occupies a prominent and extremely visible location fronting Roch Valley Way, close to its junction with Manchester Road (A58) and near to the intersection of the A627(M) and M62. 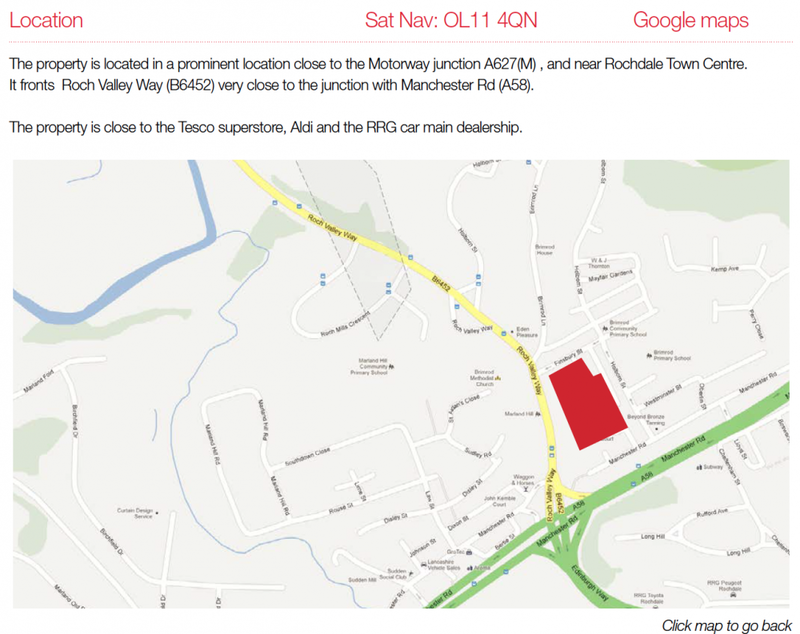 Nearby occupiers include Tesco , Aldi, Starbucks, the main RRG car dealership and Sandbrook Retail Park. Parking for up to 94 cars. Rochdale is a large market town in Greater Manchester and lies amongst the foothills of the Pennines on the River Roch. It is 5.3 miles (8.5 km) north-northwest of Oldham, and 9.8 miles (15.8 km) north-northeast of the city of Manchester. Rochdale is surrounded by several smaller settlements which together form the Metropolitan Borough of Rochdale, which has a population of 206,500. Straddled by three major motorways, Rochdale is only 9.8 miles from Manchester city centre and a short drive to Leeds and Liverpool making it the perfect place for retail businesses that value access to major markets and a large, skilled workforce. Rochdale is home to one of the country’s largest commercial developments – Kingsway Business Park. Kingsway is estimated to add £250 – £350 million per year to the Rochdale and North West economy when it is completed. Eight million people live within 60 minutes drive time of Rochdale. The premises are arranged over ground and first floor providing good clear retail space with large customer lift capable of carrying 30 customers at a time, or 2250kg of goods. The premises also benefits from a customer lift in the showroom and from air conditioning throughout. Rates Payable (2018/2019): £89,726 per annum. The property has a current planning consent for A1 retail including 20% food and 20% clothing/footwear. An application has been submitted to Rochdale MBC to remove this exclusion (details on request).